Lucia, kneeling over Alonso who seems to be suffering from a heart attack in front of Trina and Naz’s house on the sidewalk, is crying over his unconscious body. A passerby, who has more sense than Lucia, takes out her cellphone and calls for an ambulance. Trini comes out just then to see what is going on. Meanwhile, Amador is informing his son that he is to get married to Nora, ASAP. I’m surprised in this day and age, grown children would still do what their parents order them to do when they don’t want to. Rebeca pays a little visit to Mario at his work, but not before she startles Ligia with her presence and taunts her a bit before she walks uninvited to Mario’s office. What did she come for? She tells him that Alonso wants a divorce and she wants to know how she can protect herself and Nora from losing everything she’s scammed from him since she married him. This news surprises Mario because Alonso had not had the chance to speak with him about the divorce yet. It’s looking like Rebeca wants to use the same lawyer, interesting. Not a good strategy, Becs. He quickly ends this uncomfortable meeting by telling her he has an appointment, he has no time to help her right now. He can’t leave fast enough. Tactless Brigida pays Nora a visit carrying a present for the new baby, and tells Nora how happy she is that she’s going to be her daughter-in-law AND going to be a grandma. This actually makes Nora smile briefly, shocked that someone is happy about this horrid situation. But at the knowledge that the present is for the new baby, Nora becomes upset. Brigida tells her not to be upset, this is the first of many presents she’ll be giving her, and now Nora is placated, she loves getting gifts, and it gives her renewed hope that maybe she can milk this woman for more than just baby gifts. Alonso is rushed to the hospital with a crying Lucia hanging onto the gurney, with Trini tagging along behind. Magdalena shows up while Lucia takes the blame for his heart attack because she told him she was leaving. While Alonso is in the hospital, Nazario is back to work finally, not yet knowing what happened to him. Marcelo is filling him in on what he knows, he inadvertently told Alonso about Lucia’s plans, and rushed out. Just then Lalo runs up telling them that Trini is on the phone, no details. Naz takes the call and gets Marcelo to take him to the hospital, but not before he tells Lalo to keep things secret for now. Mario shows up for his meeting with Alonso, only to learn that Alonso isn’t there, and Normita can’t get ahold of him on his cell either. Amador wants to know what’s up, why is Mario there, and where is Alonso? Mario doesn’t have loose lips like some Doctor we all know, and he doesn’t divulge the nature of the meeting. Sergio has coffee with Leti, she’s looking for a job. She didn’t want to see him at work because she didn’t want to run into Rodrigo. No worries, Rodrigo got fired, she wants to know why. Maybe Leti can take Rodrigo’s job? Sergio hems and haws, he doesn’t want to tell her what he knows about Rodrigo. Naz and Marcelo arrive at the hospital and Lucia is still a bit unhinged, Marcelo tries to calm her down. Everyone convinces her to take a break and get some fresh air, and Marcelo follows after her. It’s kinda funny that no one thinks to call Rebeca or Nora. Milagro is annoying us with her constant kvetching to Raphaela about Marcelo not spending time with her, and she wants him to come back to Mexico City with her. She has the brainiac idea that she will get Alonso to convince him by telling him about his dead brother and that he fled his job and his girlfriend when he died. She’s off to take care of business. No amount of sanity from Raphaela can change her mind. Leti shows up at Lucia’s house, but Tere still doesn’t know what’s been happening because no one bothered to inform her either. Leti decides to go say hi to Nora, and runs upstairs. Sergio obviously told her everything because Leti is letting Nora have it. Rebeca comes by to defend her baby, by zinging her about her father, that her mother is a qualquiera dressed up as a descent woman. Wow, that was actually quite impressive, lol. Leti hightails it out of there. Outside, Lucia is having a drink of water while Marcelo consoles her. She feels his heart attack is her fault, but Marcelo said that it’s not, and he’s going to be ok. She asks if his dad is still alive, but alas, no, he died when Marcelo was a child, but he remembers him. But if he hadn’t died, his mother never would have remarried and…And what? she asks, he realizes he was about to mention Federico but stops himself. He rushes her back in to see if there is any news of Alonso. Oh no, Daniela calls Milagro to tell her that she’s in New York, but will be back to Mexico City next week, and wants to know where to find Marcelo. Milagro can’t be more happy and excited by the news. Milagro will pick her up at the airport to fill her in on everything. Scheming minds start to scheme. At the waiting room Sara comes in and tells them all that Alonso had a heart attack, but he’s resting now, it’s wait and see time at this point. Finally, someone realizes that maybe Rebeca should know, so Magdalena volunteers to go to the house instead of calling, and Marcelo volunteers to take her there. Lucia goes in to see Alonso and she tells him that she’s not leaving now, not ever, in fact. What a well-timed heart attack! Oh wow, Ligia hired a locksmith to open Mario’s locked desk drawer. He’s got it open, and she even gets him to give her a key to it. As soon as he leaves, she quickly finds the Gaxiola file and reads it. Magda arrives at the mansion and tells Rebeca about Alonso, only to have Rebeca’s reaction to be to tear into her about not being the first one to be told about it. (she does have a point, just sayin’) Rebeca runs up to tell Nora while Magda quickly exits. Marcelo is outside waiting and he asks if she doesn’t get along with Rebeca. Magda confesses she doesn’t, he then asks about Adriana. Well, we all know Adriana was a saint, and Marcelo wonders why Alonso married his first wife’s sister. 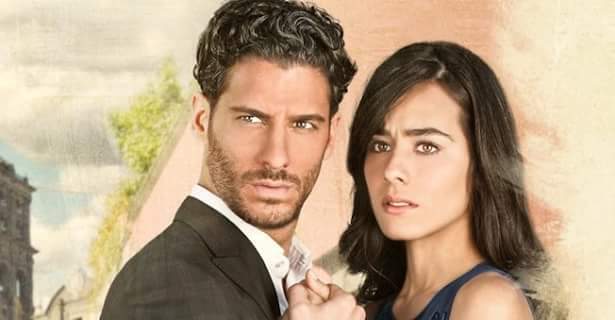 Magda says that Rebeca is very in love with Alonso, and this news is very painful for her, but Marcelo wonders that if she were really that in love with him, how could she have done what she did to him. Magda wants clarification of that last statement, but Marcelo brushes it off. Nora is also taking the for Alonso’s heart attack, when the real reason is all that Mexican food he eats and no exercise. Nora doesn’t want to go to the hospital and be judged by everyone there, but Rebeca insists. Sergio agreed to meet with Rodrigo, and Rodrigo tells him that he’s going to marry Nora now. Long story short, Sergio won’t be at the wedding, and he still doesn’t want to be friends with Rodrigo. Raphaela tells Marcelo that Milagros wants to go back home tomorrow, but she doesn’t know what changed her mind all of a sudden. Rebeca and Nora arrive at the hospital finally, and Rebeca goes off to see if she can see him. Magda tells Nora that she needs to be strong right now, and takes her leave. Rebeca is in scrubs standing by Alonso’s bed, Magda is also in scrubs outside the room talking with a nurse. Rebeca is pleading with Alonso not to divorce her, she loves him with all her might, and if he does leave her, why, she’ll kill him, she swears she’ll kill him! Just then he flat lines, and Magda comes in. What did you do Rebeca? she asks, Rebeca denies doing anything.